Wow! One of the best views on Singer Island. 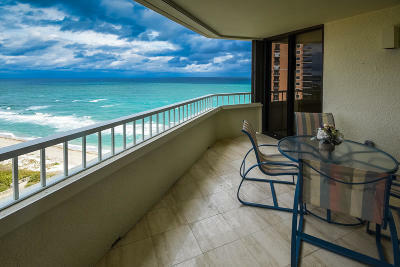 Magnificent Ocean and Intracoastal view with two spacious wrap around balconies. This condo is turn key with contemporary furnishings, unique corner bookcase, many upgrades. You will not want to ever leave! Seawinds is one of the most sought after condominiums on Singer Island with two heated pools, a library, gym, shuffleboard courts, tennis, pickle ball, hot tub, spa, temp. controlled storage & a dog park . The complex has been completed upgraded with 14 acres of land & two natural lakes. The unique 22 high seawall topped by a glass railing & 900' boardwalk enables residents to enjoy the ocean without going into the sand & offers amazing views of the beach & ocean with a private entrance to the beach.